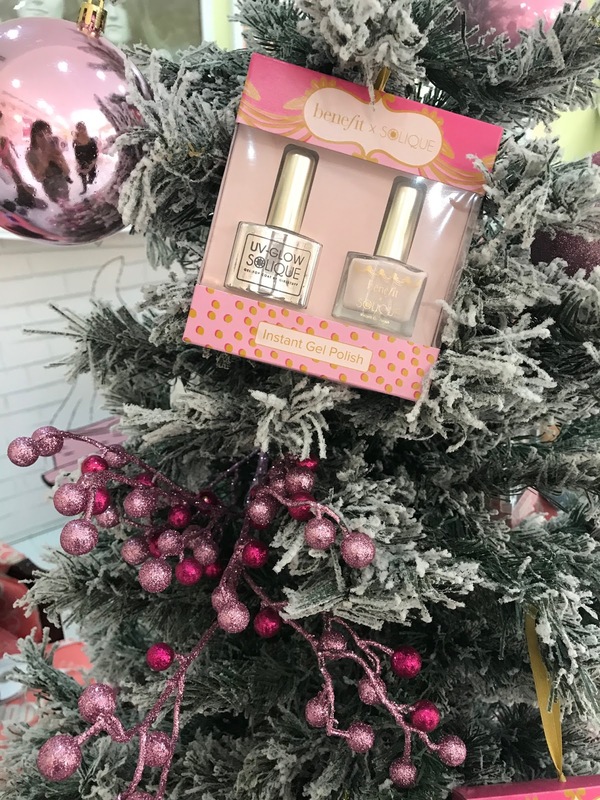 Benefit x Solique Gorgeous Goodies Collection | 'Tis the Season to be Pretty and Polished, Benebabes! The party season is upon us, and if you're anything like me, I'm always on the lookout for foolproof ways to glam up the holidays! And as I try to find more and more ways to amp up my Christmas outfits, I find that my answer is literally right at my fingertips. No matter what a woman is wearing, no outfit feels complete without that perfect color of nail polish. So I thought it would be fun to share with you guys the Benefit x Solique Gorgeous Goodies Collection which I think will be great for wearing in many different ways. Also, these are the perfect gifts for your BFFS! 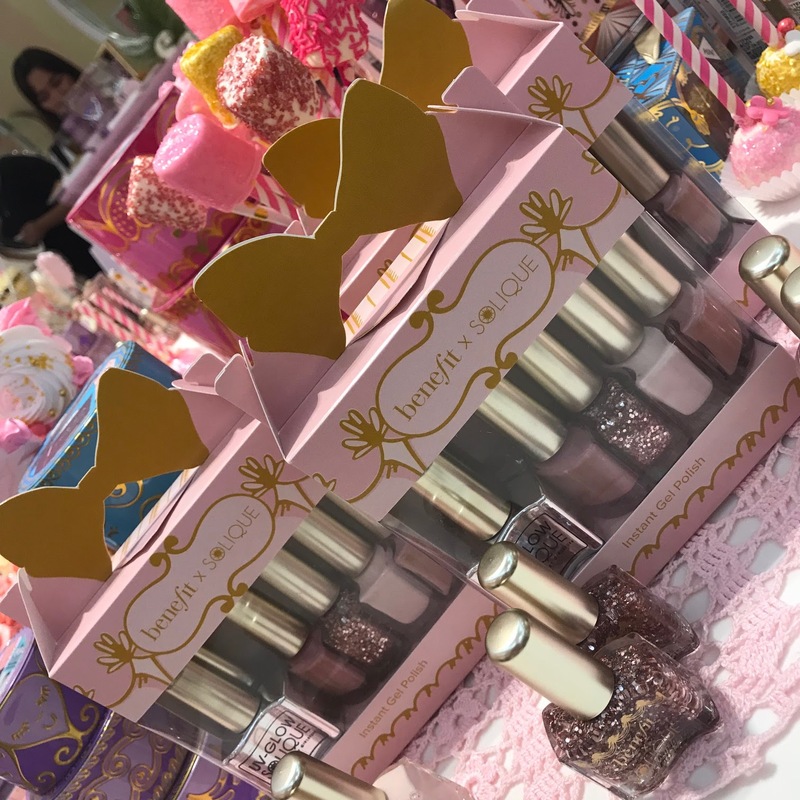 Solique, a sister brand of my favorite Girlstuff Nail Polish, creates an exclusive holiday nail polish collection called Gorgeous Goodies, in collaboration with Benefit Cosmetics Philippines. Think pink and just imagine “the Winter Wonderland shoot in 13 Going On 30” fused into nail polishes, spewing delicate shades of pink and glitters. It seems like they were designed with the holidays in mind! With Solique Gel Nail Polish, it's super easy to achieve that Gel Effect without having to undergo the harsh process of exposing your hands to UV light exposure. Plus, it’s free from three of the most damaging and toxic ingredients (Dibutyl Phtlalate, Formaldehyde, and Toluene!) commonly found in cheaper and generic nail polish. These new limited-edition holiday boxed sets filled with goodies are inspired by their brand's philosophies and has 4 unique shades so you can pass the quezo de bola in style. They have the most mesmerizing nail polishes that can be worn in a hundred gorgeous ways! Especially when paired with a pink cocktail dress, I think. Whimsy is a feminine pink hue with a subtle hint of pearlescent that’s sure to complement any skin tone. Dream is a simple yet stunning shade of white with a tinge of pink. Charmed, a soft and dreamy shade of muave with a subtle hint of pearlescent. My new favorite! Twinkle is a pink shade with white sparkles, that feels just right this time of year. When you can’t decide on which polish to wear, you can mix and match the colors because each gorgeous shade goes well with all the others! 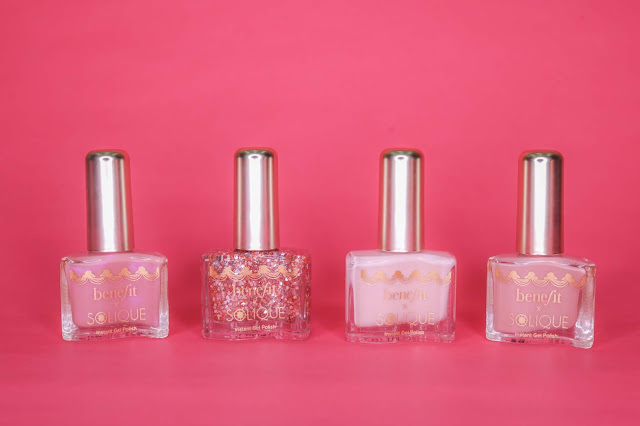 BenefitxSolique Gorgeous Goodies Collection 6in1 Gift Set (₱1,300.00) contains Twinkle, Dream, Whimsy, Charmed, Solique Anchor Grip and Solique Gel Top Coat. 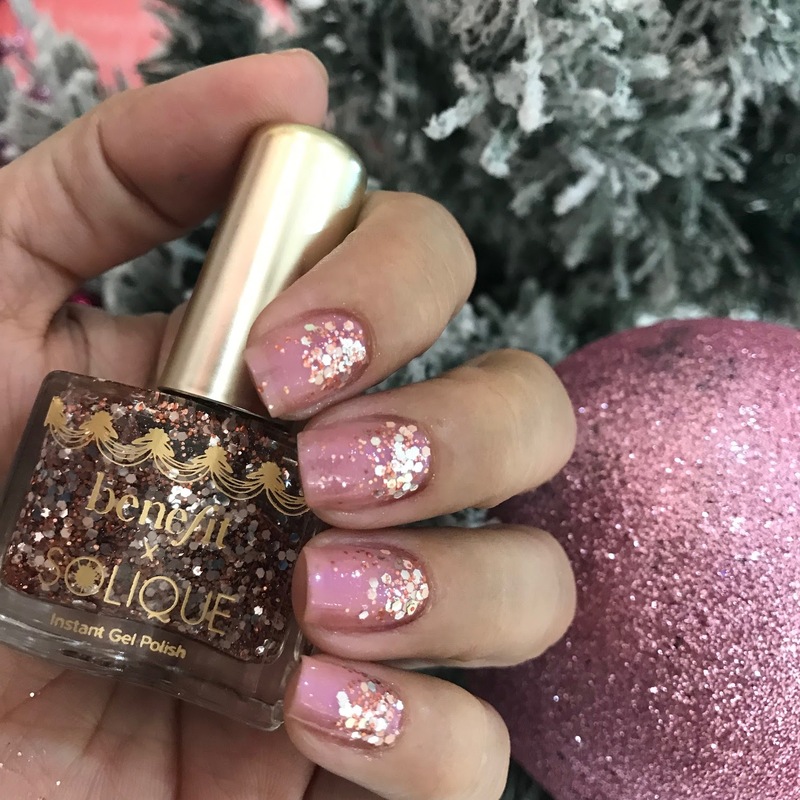 BenefitxSolique Gorgeous Goodies Collection 2in1 Charmed Gift Set (₱450.00 ) contains one of the Gorgeous Goodies shade and a SOLIQUE GEL Top Coat. These boxed sets are available in Girlstuff Kiosk/Carts Mall of Asia, SM North Annex, SM San Lazaro, SM Megamall, Glorietta, and Alabang Town Center. You can also purchase through their partner websites (Sephora, Zalora, and BeautyMNL) or at www.girlstufforever.com. Benefit also came up with new Holiday Gift Sets that scream "Prettyyyy!!!" without saying a word. With every Php3,000 purchase, you get a free full makeup service application perfect when you need to head on a party! Choose from 3 options - Glow Getter, Head Turner and Trend Setter! Also, I got my eyebrows waxed and nails done for free during the Benefit x Solique Media Launch. It was quite an experience since it was the first time that I got my brows waxed by none other than the Brow Boss, Ms. Celina of Benefit. 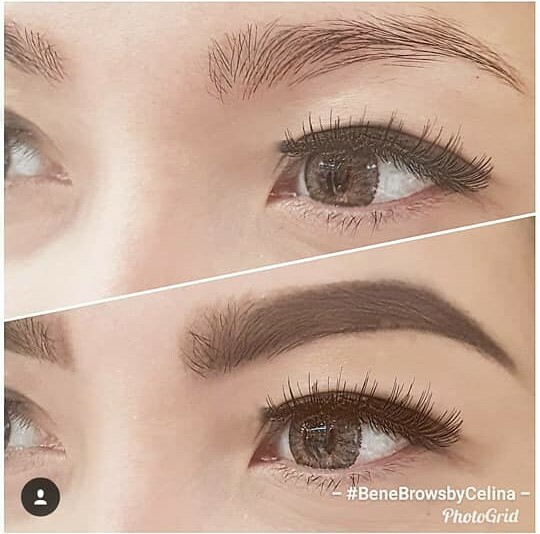 I had the most impressive brow makeover! I completely love it! Thanks A LOT, Benefit, for my newly groomed brows. The whole process was surprisingly quick and painless! :) You should try it too! The brow bar is available in all Benefit Branches. They also offer other waxing services (Upper lip, underarm, legs, arms, facial hair. etc.) You can book your appointments at www.benefitcosmetics.com. Thanks, Benefit and Ms. Janina of Girlstuff/Solique, for having me. It was such an enjoyable experience. Plus, I've had so many compliments on the brows and my fabulous Holiday party-perfect nails! Happy to report that their polish lasted 2 weeks on me without chipping! Yay! Happy shopping, benebabes, and make sure you let me know which one of these boxed sets are included in your Christmas wishlist. I’d love to hear!